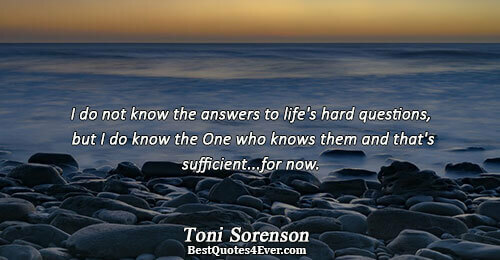 Toni Sorenson is the author or a number of bestselling books for both the national and LDS markets. In 2006, her Covenant novel, "Redemption Road", won the prestigious Association of Mormon Letters honor for novel of the year. The roadmap to a rich, rewarding life is to follow your passion, to be willing to deviate, to never dull to the dawn of a new day and all of the possibilities it holds for adventure and discovery. 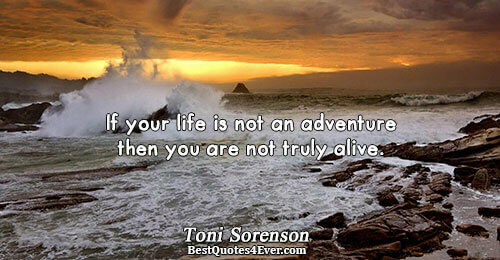 If your life is not an adventure then you are not truly alive. Be your own best buddy. If you have a painting in you, paint. If you have a song to sing, sing. Don’t judge your creation. Just create it. Banish doubt and fear and step out of your own way if you have to. Write if you’re a writer and invent if you’re an inventor. Do what you were born to do. Only then will you know a remarkable life. In God's economy, nothing is slag, nothing is wasted. Every relationship we build is a teacher, every experience we have is a coach. In every scar there is a lesson. In every memory there lives potential to make more. Certain people will be upset when you speak the truth. They might get mad. They might get really mad. That's because they are still living the lie you've exposed. Stay strong. Speak truth. Do not allow yourself to get pulled back into their lie just to make others happy and yourself miserable. You are free. Stay free. The truest of all truths is this: You are a child of God. Out of more than six billion people on earth now, He knows your name, what you fear and what you revere. He cares about the things you care about. He wants your happiness and success, and will reach to the farthest corner of the universe to see that you obtain your noblest dreams. God is not someone you meet when you die. 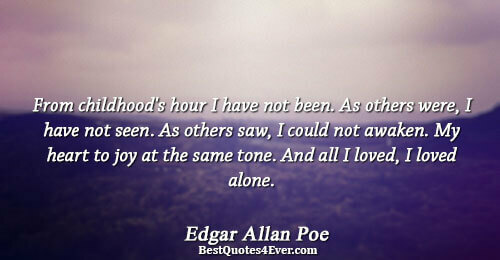 His smiling face will be the first and the most familiar to greet you on the other side of mortality. You’ll recognize Him and know in your heart of hearts that you’re not entering a new sphere, but returning home to the place you’ve always belonged. I do not know the answers to life's hard questions, but I do know the One who knows them and that's sufficient...for now. Every human being has divinity encased within its spirit and it is the task of its creator as well as itself to set it free. No human being is an end product, every being still breathing is a creation still under creation. The most destructive thing we can possibly do in life is to make another person doubt his worth and identity as a child of God. The very most productive thing we can do is to help ourselves and others realize that as children of God, our worth is infinite. You were born into this life equipped to succeed. You are a part of God’s perfect plan. Yes, you. The plan would not be perfect if you were missing. Think about that. You matter more than you know. We are in God’s hands. We can’t come up with a surprise big enough or a sin vile enough to thwart His plan. If we allow Him to refine us we will inevitably end up free from the impurities that separate us from Him. No human mind can fully grasp the gift of Christ’s atonement, the vastness and inclusiveness of the act - but in the end, it comes down to just you and Jesus. You’ve come, and He’s met you with open arms - and now it’s just between the two of you. I challenge you to make your life the masterpiece you want to paint, the novel you want to read, the day you want to wake to. 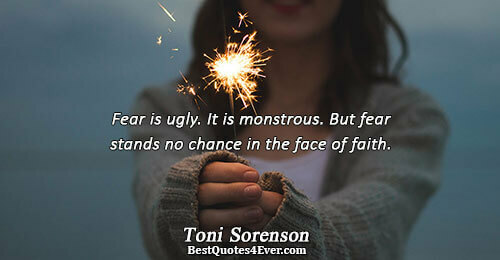 Fear is ugly. It is monstrous. But fear stands no chance in the face of faith. Our business is to be free of anything that separates us from God, who has created us to simply be happy and to progress. Strength comes from struggle. When you learn to see your struggles as opportunities to become stronger, better, wiser, then your thinking shifts from "I can't do this" to "I must do this.